Be ready for anything with our paracord bracelet. With a military history routed in Airborne units, parachute cord has been used for hundreds of uses when survival and operational situations demand. Made from 550 LB. test 7 strand core, 100% nylon cord, this bracelet has approximately 7 feet of emergency cord when disassembled. 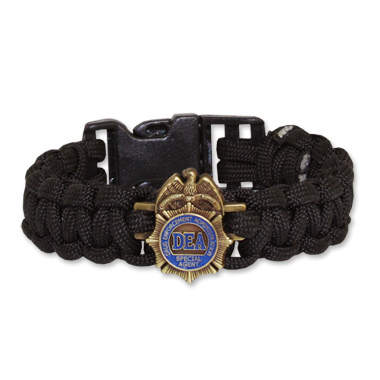 The DEA badge emblem is woven into the bracelet and captured halfway along the length of the cord. Small - apprx. 7"+ or Large - apprx. 10"+. Designed for Youth/Men/Women.